WUTMI is organized between the 26 local chapters (in Marshallese “Jepta co”) located across the differents atolls, including two abroad. Each of these chapters is made up of one to thirty-five individual women’s organizations, with each organization consisting of a minimum of ten women members. The founding members (honorary without voting rights) and women traditional leaders (honorary with voting rights) are also members of WUTMI. To be a WUTMI member, a chapter must have its own set of corporate papers, be operational with established officers and active members, and pay registration and annual membership fees. The Executive Board decides of the annual priorities that the Executive Committee will implement. The Board of Directors consists of the presidents of each local chapter, WUTMI officers, as well as founding members and Leroij (Women Chiefs) who serve as advisors and mentors. The Board of Directors is governed by a set of approved bylaws and oversees the Executive Committee. 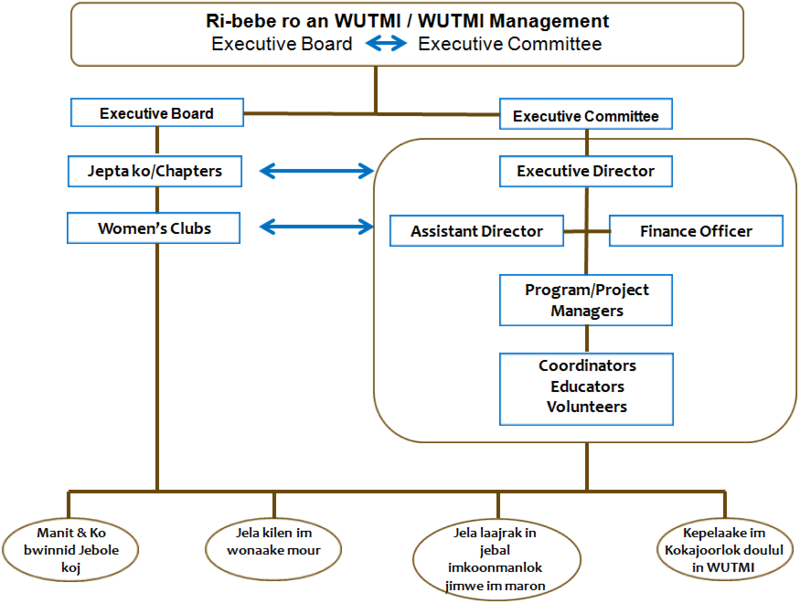 The Executive Committee consists of WUTMI officers, elected presidents of Majuro and Ebeye chapters, outgoing WUTMI President, one member-at-large, and two advisors. The Executive Committee oversees the administration and project funding. The Executive Committee members are all volunteers, however they meet every other Wednesday (twice monthly) and are highly committed to the organization.